I’ve been making this chili for the last few years, it’s always a hit! I want to make a freezer meal for a friend who’s getting ready to have a baby. Am I OK to freeze the ingredients uncooked (to be put in the crockpot later) or should I cook everything and then freeze? Thanks in advance! Hi Amber! Yay! So happy to hear this recipe has worked out so well for you! If you’re going to freeze this, I’d recommend cooking everything together and then freezing it (vs. just freezing the uncooked ingredients). It’ll taste a lot better if you cook it and then freeze. Hope that helps and congrats to your friend! For something really different, try adding a bit of peanut butter. 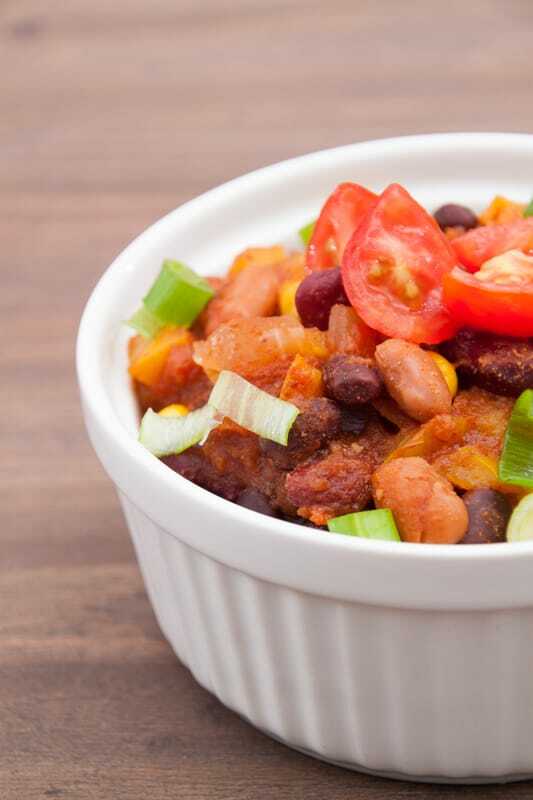 It adds some fat and a few calories, but it goes really well with the already great flavor of this chili. About 1tsp or so per serving. Yay!! So happy to hear that Tom! Really interesting idea about the peanut butter – I’ll have to try that next time! 🙂 Thanks for letting me know! Hi there, just wondering – when you say chilli powder, are you referring to actual ground chillis or the chilli powder blend which contains chilli, oregano, cumin, etc. Hi Joe! I’m talking about the chili powder blend that you can buy at the grocery store – this is a good example. Hope that helps! Finally got around to trying the recipe. It really was the best vegetarian chilli that I’ve ever had! Thank you! I think I might add some more cumin next time though. I’d also like it a bit more spicy. What do you suggest I increase for this? More cayenne? Thanks again. Yay!! So happy to hear that Joe! And yes absolutely – if you want more spice (like hot – pepper spice) – then add more cayenne and chili powder too. Hope that helps! So glad you liked this recipe! Try adding Light Life Smart Ground, leave it chunky. Use way more cocoa and ancho chili powder if you really want to rock it. Thanks for the tip Rick! But actually, I wouldn’t recommend using Light Life Smart Ground because it’s a very highly processed, soy protein based “fake meat.” Take a look at the ingredients: Water, textured soy protein concentrate, soy sauce (water, soybeans, salt, wheat), less than 2% of: chicory extract (inulin), natural flavor (from plant sources), salt, barley malt extract, caramel color, evaporated cane syrup, barley malt, hydrolyzed soy and corn protein, molasses, yeast extract, dried garlic, dried onions. The textured soy protein concentrate, hydrolyzed soy protein are problematic as ingredients to eat on a regular basis (I have more details on why here). But love the idea of using more cocoa and ancho chili to give it more heat! Hope that helps! I’m making this chili right now. I just tasted my first bite and WOW! So flavorful! I didn’t have any green or red peppers on hand so those didn’t make it in. I don’t have frozen corn either…so I figured I’d use canned-but then I found there was none in my cabinets! So I used a can of mixed veggies that had corn in it. I drained and rinsed it so that the liquid wouldn’t interfere with the flavor. Despite my changes it is yummy! I can’t wait to make it again with the peppers! 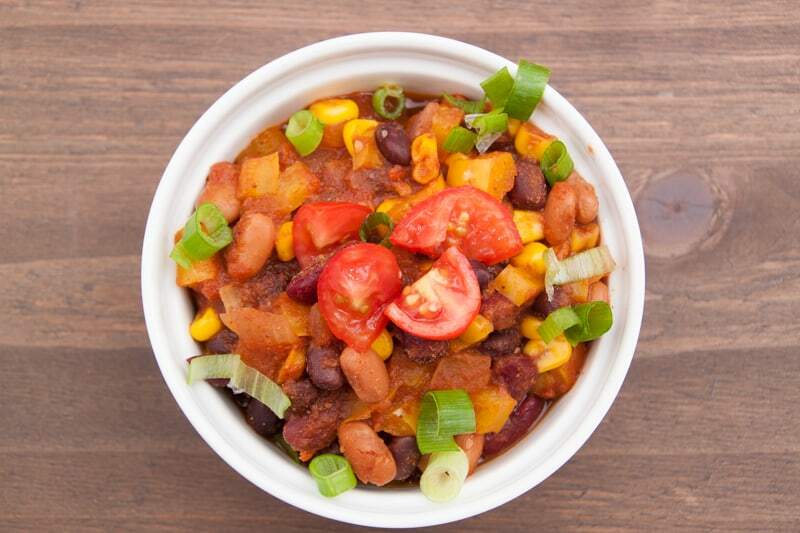 This is our go to chili. I make it often, and I always get positive comments from all ( vegetarians and meat eaters alike. 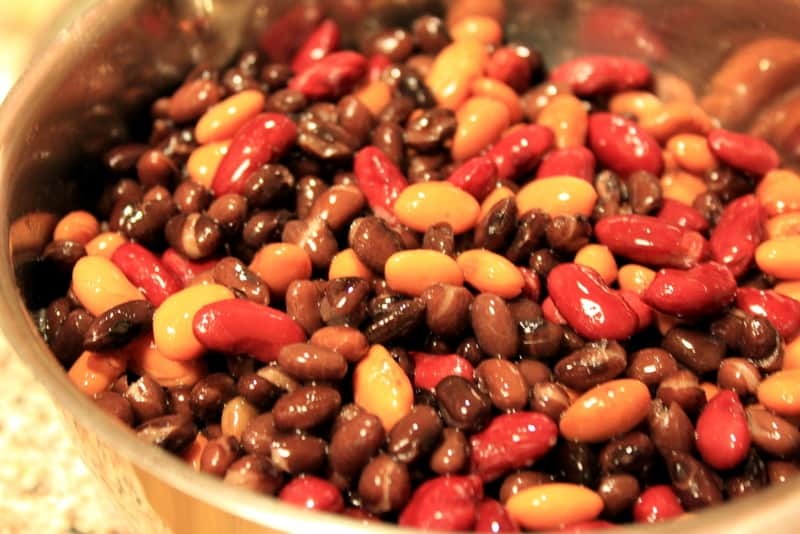 I use what ever beans we have available and I used canned corn because it is usually available. 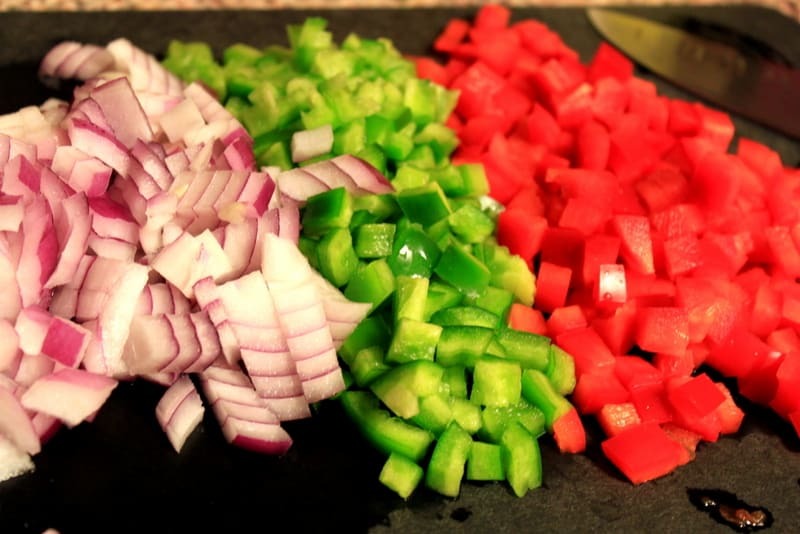 Don’t like green peppers so I use all red or yellow, sometimes I even add another vegetable. It is sincerely ALWAYS a hit. Thank you for this recipe. Awww yay!!! That’s so awesome to hear Chris!! Yeah you can totally mix up the veggies in this based on your preference and it should still always work 🙂 Thanks for letting me know! Woohoo! That’s awesome Phil – so happy to hear that! I love freezing this recipe – it defrosts great – you won’t even be able to tell it was frozen 🙂 Enjoy! 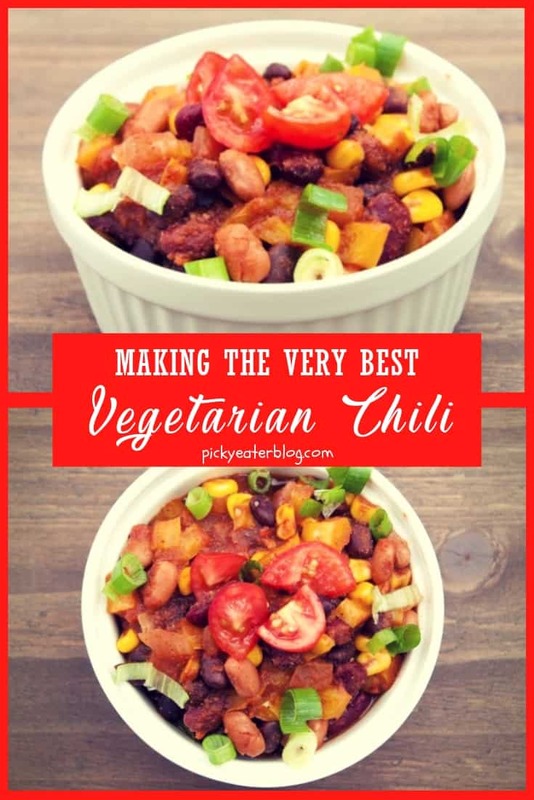 I was so excited to find this recipe yesterday – I’m always on the look out for a good Vegetarian chili because there are so few. I made this and the cornbread today and it was amazing! The hubby loved it too! I think my can of crushed tomatoes was a little too tangy so I add 1/2 tspn more of the cocoa and that fixed that problem! And let me just say, thank you for introducing me to Trader Joe’s Cornbread! It was so delicious and the perfect pairing with this chili. I topped with avocado pieces and a little cheddar cheese. I’m going to try this in the slow cooker next time. 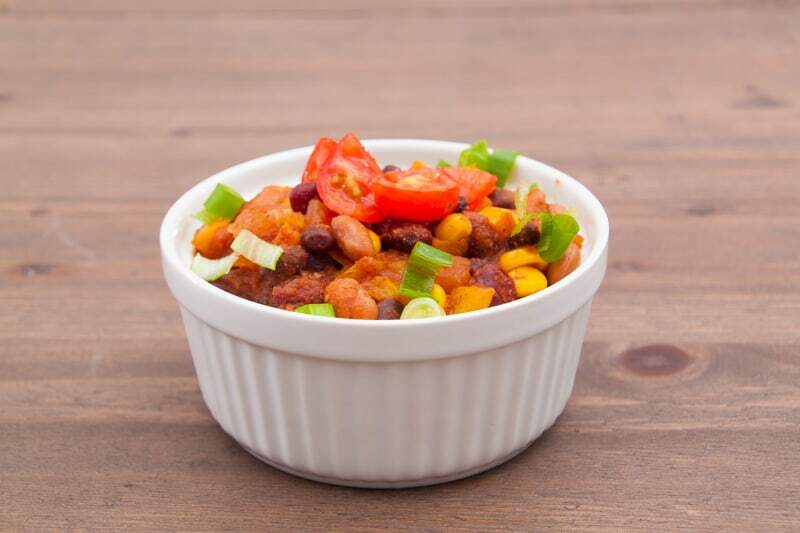 I have finally found a veg chili recipe keeper! Thanks so much for this recipe! 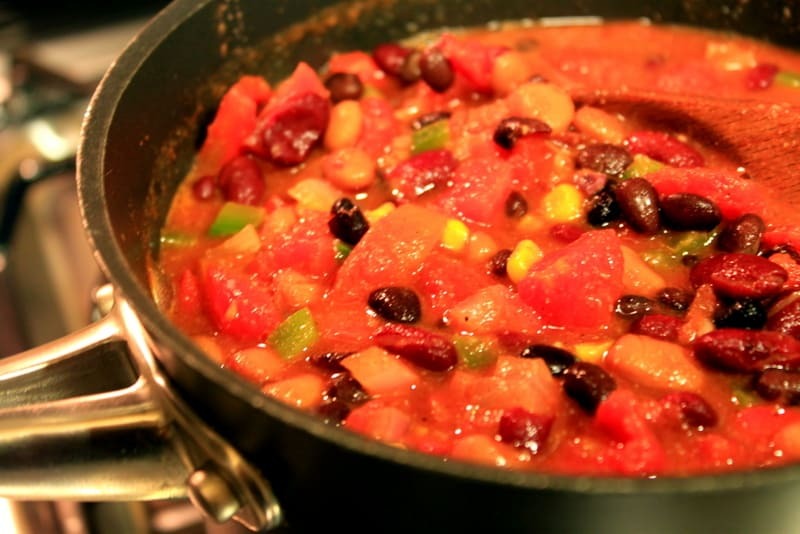 I’ve been looking for a good vegetarian chili recipe, and this is definitely the winner. I made it in the winter and LOVED it, then froze the leftovers. The other day I reheated some, and it was just as good as the first time around! My favorite parts are the three types of beans (I love beans! Am I allowed to say that? Haha) and the slight spicy kick. It’s perfect! I did make one substitution based on what I had on hand: I used one 15 oz can crushed tomatoes + canned tomato paste w/ water added. Awww thanks Casey!! I freeze this recipe all the time – I agree it reheats really well! 🙂 Haha I love that you love beans — I do too! They are one of my favorite ingredients because they’re hearty, healthy, full of fiber and protein and veggie friendly. Love the substitution idea too! Thanks for letting me know! Wow, this looks like a great recipe. I usually make a turkey chili but never use all these different ingredients. I’ll definitely be mixing in some of your ingredients for my next batch. What tool do you use to get the nutritional values? MenuCalc? Thanks Jose! I use Spark Recipes calorie calculator to get the nutritional information for my posts. I’ve found them to be very accurate and thorough! Awesome. And its Free. Thanks for the Tip! This is phenomenal! I just finished a bowl and can’t wait for future meal times 🙂 The spice level was JUST RIGHT and with some yogurt it was great. Hooray!! That is so wonderful to hear, thanks for letting me know Amna! Love that you served it with yogurt too – it’s a great substitution for sour cream (which traditionally goes on chili)! This is a good recipe. I doubled the cumin, smoked paprika, and salt to enhance the flavor. It definitely could use more spiciness, so next time I’ll try adding fresh jalapenos and maybe double the chili powder and add some crushed red pepper. But otherwise a really good recipe. I have never seen cocoa powder in a chili recipe, but I could see it working. Have you tried cinnamon or bay leaves? I’ve tried them before in other vegetarian chili attempts and liked them. Hi Brianna! I haven’t actually tried cinnamon or bay leaves in this recipe – but I’m sure those would taste great. I’d definitely encourage you to try the cocoa powder though – it really makes this recipe great! This is without a doubt,the BEST!!!!! recipe. Thank you so much for posting this. I made this for a superbowl party and the entire meat eating crowd loved it. Thanks again for such a flavorful vegan recipe..
Awww yay! Thank you so much Karen! So glad this turned out well for your superbowl party! I added a poblano and a couple serranos, as I can get them at the Puerto Rican grocery around the corner for a song. Great recipe. Great! So glad to hear you liked this! I found this recipe a few years ago and have since made it numerous times. It is absolutely fabulous, and I figured it was time to thank you for the post because everyone I make it for raves about it! I’m fairly certain there isn’t a soul out there who wouldn’t eat this chili. Thank you so much Mary — I love that you’ve made this so many times at home! It’s so great to hear the positive feedback, so I appreciate you coming back here to let me know 🙂 Thanks again! Really Great! Showed up to a Thanksgiving get together with one picky vegetarian, and after all the leftovers were in Tupperware, the meat- eater guys kept going back for more chilli! It was a big hit, and my new favorite recipe!- Also, I doubled it, but not the onion- and I used one can of diced tomatoes along with one can of crushed. Thank you so much for the recipe- I will be e-mailing this link to everyone I know! Aww that is so great to hear Rose! Thank you for letting me know! I love making a double batch of this recipe too — sometimes I’ll even freeze the leftovers and they still taste great when we eat them! I’ve made this a couple of times now and it is awesome. Only had 1 can of beans on hand but that was plenty. I added some texture and nutrition by chopping up a couple of veggie patties I wasn’t crazy about and throwing them in there. I also added some sliced mushrooms and even my carnivore husband enjoyed it served with a sprinkling of cheese, chopped avocado and sour cream, It’s going in my permanent collection. Thank you. That is so great to hear! Great idea to throw some veggie burger patties in for some texture too. Thanks for letting me know Sky! Umm this is awesome chili! Thanks for the recipe. Hehe yay! No problem – so glad you liked it Jessica! This is my go-to recipe for chili. I discovered it last fall and made it at least every other week! I generally don’t add the cocoa or the soy sauce & modify it to be slightly less spicy. 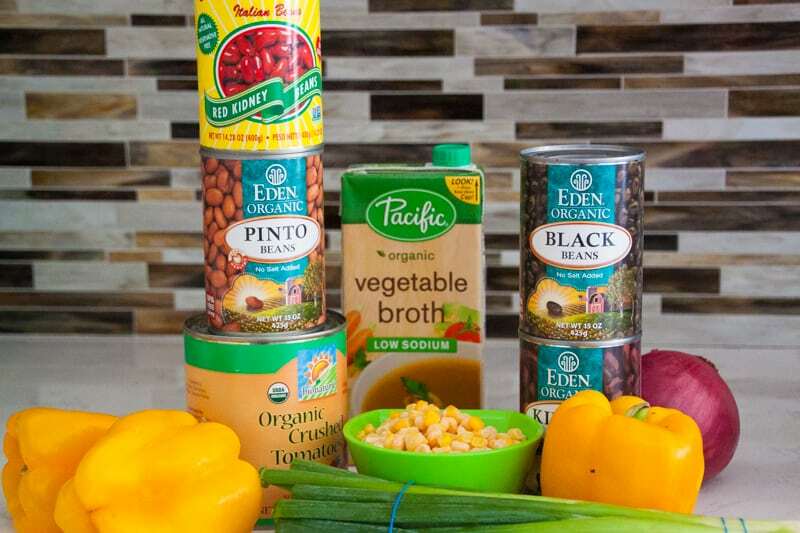 I also use canned corn instead of frozen, as well as sub tomato juice when I don’t have veggie broth on hand. My favorite mod is adding vegetarian mycoprotein (Quorn grounds). I did this last year & fed it to a large group of guys. I didn’t tell them that there wasn’t any meat in it until afterward. They said it was the best chili they ever had and couldn’t believe it was vegetarian! 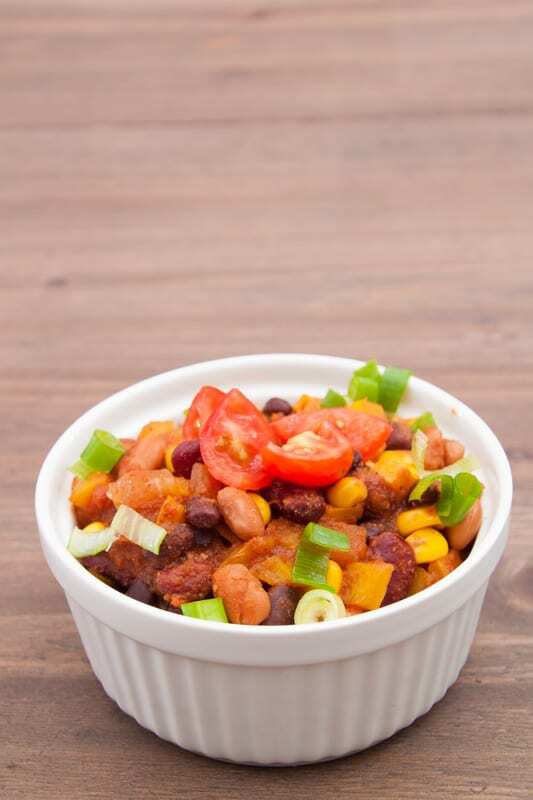 The Quorn grounds add fabulous texture indistinguishable from ground beef & boost the protein content! I make my own modifications here & there, but this is an AMAZING recipe whether you follow the instructions exactly or feel comfortable enough to make it to your own taste! When I make cornbread to go with, I generally use good ol’ Jiffy corn muffin mix & add some no salt added canned corn & tablespoon or so of sugar. Thank you so much for sharing all of this Chelsea! I love the modifications you made – and you’re absolutely right – this recipe can totally be tweaked to suit anyone’s tastes and preferences 🙂 Thanks again – so glad you liked this recipe! !